What girl wouldn’t love to have a stylish and glamorous cell phone?! But why pay good money for one when you can make your own? Whether you own an Android or an iPhone; you can make your phone look amazing by just following these simple and easy DIY techniques. Here are some of the trendiest and easiest DIY phone case ideas that you can create in your home. Not good at crafting? No problem!! These ideas are simple enough that anyone can do them! Using glitter to add some sparkle is one of the easiest DIY phone case ideas. And the best part is glittery cases are always in and will give pretty much any phone a trendy chic look. All you need is a phone cover, a little glue, and some glitter in a bowl or other container. To get started, apply a light coat of glue all over the cover . Next, dip or roll the case thoroughly in the glitter. Let it dry for around 2-3 hours and voila, your shimmery case is all ready for use. You can also use a combination of two or three glitters or even give it a rainbow appeal. No matter how you play with glitters, in the end, you are bound to get a trendy and unique case. Craft paper is amazing. There is so much you can make with it, including your own changeable cell phone case. Who wouldn’t want a phone case that can be changed on a whim? How cool it will look! Here is how you can make this extremely cool DIY phone case idea. To get started, gather together a clear phone case, craft paper in a design you love, and some scissors. 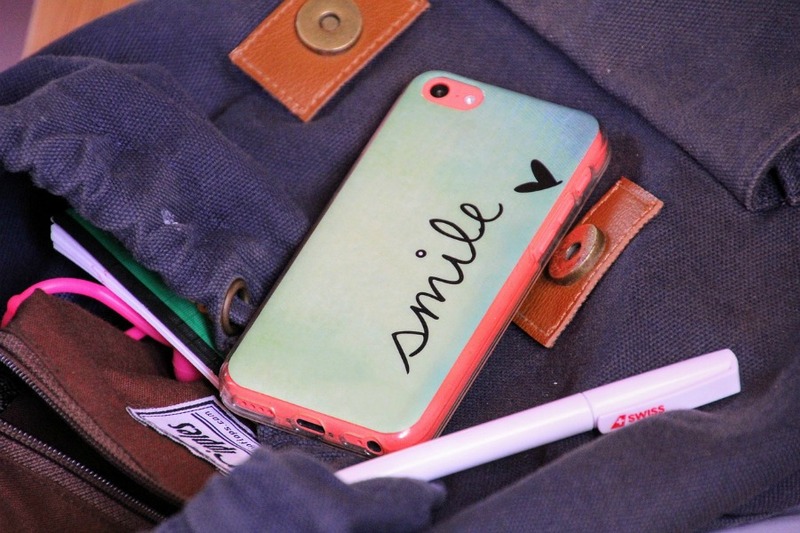 Trace your phone case on the back side of the patterned paper, cut it out and then place the paper inside the case. Use your finger to smooth around the edges to make an impression where there is any overlap, and then trim to fit. When you get bored with your current look, simply find another paper you like and follow the same steps. No craft paper? You could also use wrapping paper, tissue paper, or even an old greeting card. All kids love stickers! And if you were born in the 90’s, then you must have been crazy about them! Stickers will go on any color phone cover and can be a fun reminder of your childhood. Arrange the stickers in any way you want, and they will quickly will give your phone a different appearance. If you have a liking for vintage then this DIY idea for decorating your cell phone is definitely for you. All you need is a transparent phone case, some glue and a printer. Simply print out any vintage map or photograph and paste it on your phone case. Allow it to dry completely, then add some clear lacquer for extra protection. After several hours for drying, you new cell phoine case will be ready for use. This particular DIY phone case idea is perfect for those who love bold accessories – and the beach! All you need to do is buy or collect some different seashells. Apply some glue to any phone case and then place the seashells in whatever arrangement you like. You could also break the shells into smaller pieces and use them to create a mosaic. Another easy DIY idea for decorating your cell phone case is to apply some of those temporary tattoos. Just like with the sticker idea, simply apply the tattoos to your phone case and let dry. Follow up with some type of clear protectant to make it more durable. A really great phone case is one of life’s little joys! Luckily there’s no need to spend the money on a designer cell phone case when you can quickly and easily make your own with one of the above DIY phone case ideas. We hope that these amazing DIY phone case ideas will help give your cell phone a more chic appeal. And to ensure that your new trendy cell phone is secure, consider installing a tracking app in your device. For the latest reviews on such apps, check out flexispy review.